Kaiser Permanente has its newest health plan acquisition in Washington state to thank for what its treasurer says might be its largest year-over-year revenue growth. The not-for-profit Oakland, Calif.-based system, which includes Kaiser Foundation Health Plan, Inc., Kaiser Foundation Hospitals and their subsidiaries, saw its operating revenue jump by $8.1 billion in 2017, a 12.5% boost, mostly thanks to its massive health plan. Operating revenue was $72.7 billion in 2017, compared with $64.6 billion in 2016. "I would say you could almost characterize it as record growth," said Tom Meier, Kaiser Permanente's senior vice president and corporate treasurer. The system's operating margin held steady at 3% during that time, which Meier said is in line with expectations. Membership in Kaiser's health plan skyrocketed by more than 10%, or 1 million people, last year, including more than 650,000 members from its Group Health Cooperative acquisition in February 2017. As of Dec. 31, 2017, 11.8 million people were enrolled in Kaiser's health plan. Kaiser's net non-operating revenue increased from $1.2 billion in 2016 to $1.6 billion last year. That was mostly from short- and long-term investments in fixed income and equity, both of which performed well, in line with most portfolios last year, Meier said. "The markets are the markets, and we did participate in them," he said. The system spent $3.3 billion on capital projects last year, a $500 million increase from 2016, which Kaiser's annual report said reflects its ongoing commitment to its facilities and technology. The system reported that visits to its website grew by 18% last year compared with 2016, and it reported having filled nearly 25.5 million prescriptions through digital channels, an increase of about 17% from 2016. Members also viewed more than 48.7 million lab results online last year, about 7% more than in 2016. Last year, Kaiser opened its 39th hospital, the San Diego Medical Center. It unveiled 15 new medical office buildings in 2017, and 25 more are slated to open in the next 12 to 14 months. As of the end of 2017, Kaiser had 682 medical office buildings. Kaiser dedicated about $2.8 billion to community health programs last year, or about 3.9% of operating revenue, including health activities, partnerships, community health projects and medical care and coverage for low-income individuals. 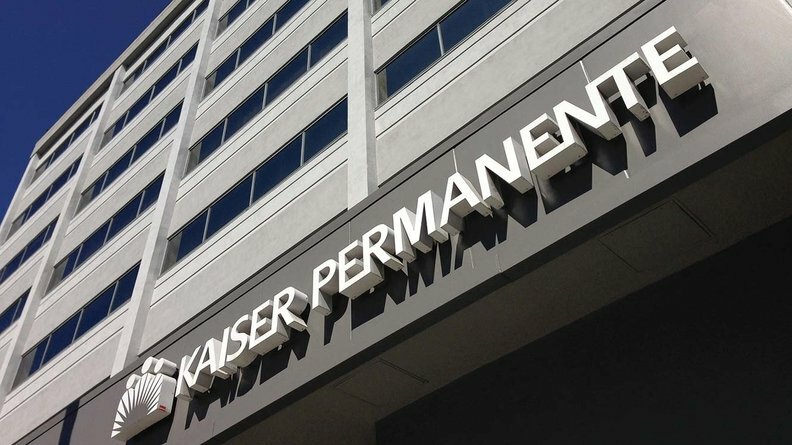 As an integrated organization, the vast majority of Kaiser's revenue comes from its health plan arm, which reimburses the hospitals to cover their costs, Meier said. Unlike other health systems, which strive to boost lagging admissions, Kaiser is trying to do the opposite, as their patients are their health plan members. "We do best when the hospital is empty," Meier said. Instead, the system focuses on preventive maintenance to keep its members healthy.